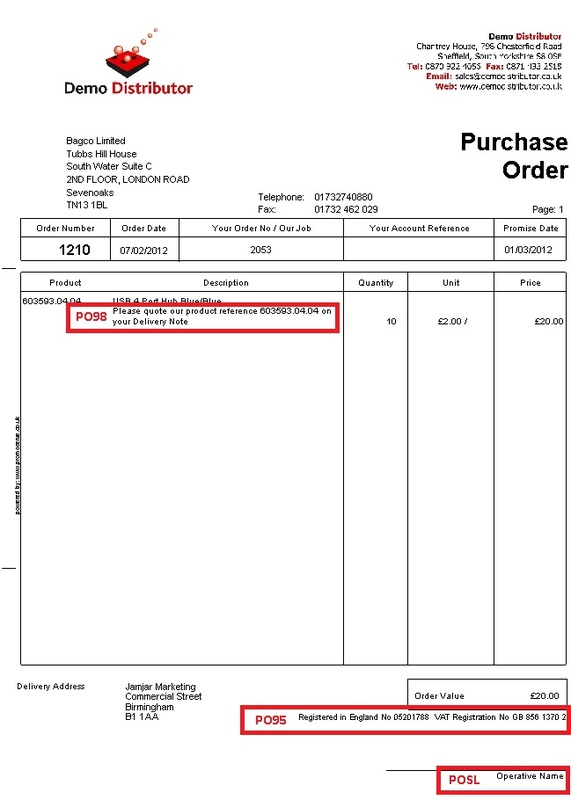 Many of the documents which can be printed/emailed from PromoServe such as Sales Order Acknowledgements and Quotations often contain built-in 'Phrases' which can be customised by the user. Below is a list of the areas in PromoServe that utilise built in Phrases. Each point details the commonly used Phrase Codes, and their specific function. A downloadable example image of each document type is also provided so the location of each Phrase on the document can be seen. First you need to know how to enter the Codes & Phrases screen. To do this, navigate to ‘System Personalisation’ from the main menu, then click on ‘Codes & Phrases’. The 'Codes and Phrases' screen will now be displayed. You can navigate to a specific phrase code by entering the phrase code in the 'Phrase Code' field at the top of the screen and then pressing TAB on your keyboard. Alternatively, you can jump to a specific group of phrases by selecting the 'Type' tab at the top-left of the screen, then entering the two digit phrase type and pressing TAB on your keyboard. Click HERE to download a full size image of an example Order Acknowledgement. The image shows phrase codes that are commonly used when creating Order Acknowledgements so you can find them more easily within Codes and Phrases. Phrase Code: STDS - Defines the order in which product information is displayed when a product is added to a Sales Order. 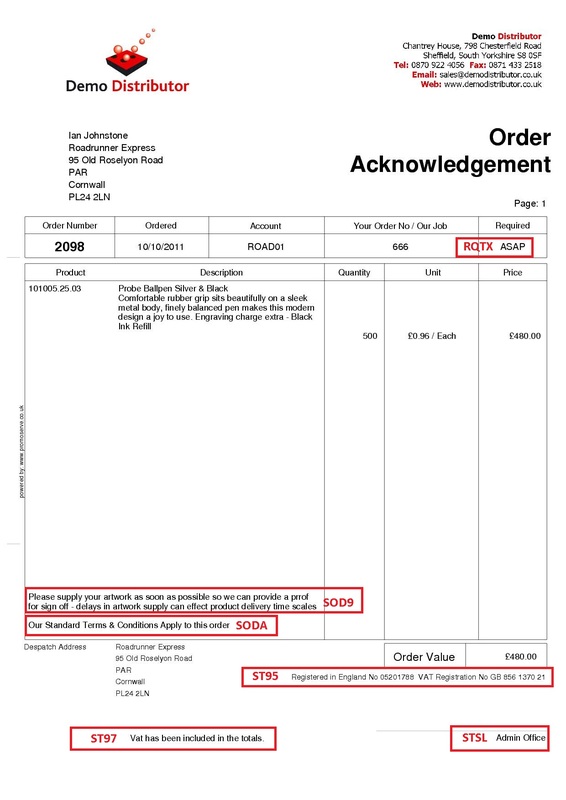 Phrase Code: ST97 - The text that will be displayed when the 'Prices Include VAT' tickbox has been ticked on the Order Acknowledgement. Phrase Code: STSL - The text that displays at the bottom right of the Order Acknowledgement. By default this will show the Operative Name of the user currently logged in. Phrase Code: ST98 - Text that will be displayed when the 'Prices Include VAT' tickbox has not been ticked on the Order Acknowledgement. Phrase Code: RQTX - Defines the different options available for selection on the Print Options screen for when no required by date has been entered on the Order Acknowledgement. For example 'TBA' or 'ASAP'. Entries should be separated by a | (pipe character). Phrase Code: SOD9 - Text that will be displayed as the last line on the Sales Acknowledgement when it is first created. This text will be visible in the SO screen prior to printing/emailing. Phrase Code: SODA - Text that will be displayed directly after SOD9. NOTE: Text defined here will only display if Phrase Code SOD9 already exists. Phrase Code: ST93 - Text that will be displayed at the bottom of the Order Acknowledgement when the SO currency is different to the PromoServe system currency. Phrase Code: ST95 - Text relating to company and VAT registration details that will be displayed at the lower right of the Order Acknowledgement. Click HERE to download a full size image of an example Quotation. The image shows phrase codes that are commonly used when creating a Quotation so you can find them more easily within Codes and Phrases. Phrase Code: QT97 - The text that will be displayed when the 'Prices Include VAT' tickbox has been ticked on the Quotation. Phrase Code: QT98 - Text that will be displayed when the 'Prices Include VAT' tickbox has not been ticked on the Quotation. Phrase Code: QT99 - The text that displays at the bottom right of the Quotation. By default this will show the Operative Name of the user currently logged in. 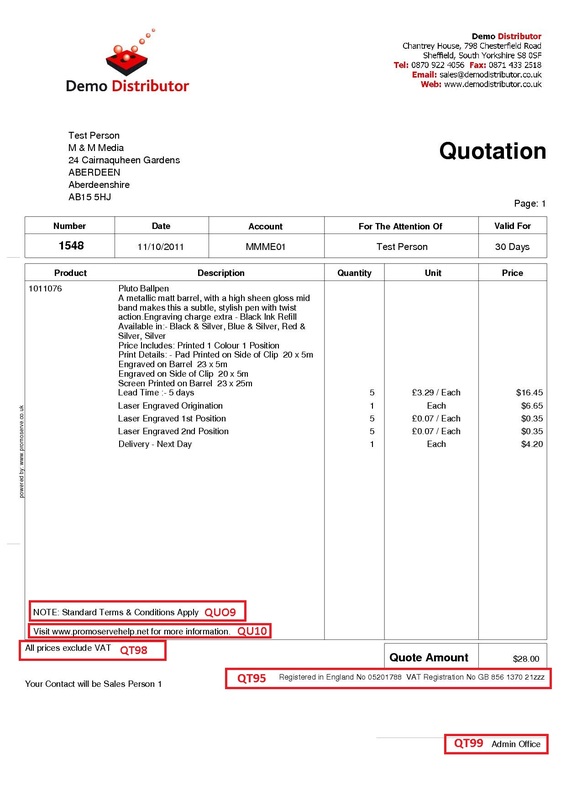 Phrase Code: QTDS - Defines what product information displays on the Quotation when a product is added to a Quotation, and the order in which the information is displayed. Phrase Code: QUO9 - Text that will be displayed as the last line on the Quotation when it is first created. This text will be visible in the Quotation screen prior to printing/emailing. NOTE: The 'O' is the letter O, not the number 0. Phrase Code: QU10 - Text that will be displayed directly after the text defined in QUO9. NOTE: Text defined here will only display if Phrase Code QU09 already exists. Phrase Code: QT95 - Text relating to company and VAT registration details that will be displayed at the lower right of the Quotation. 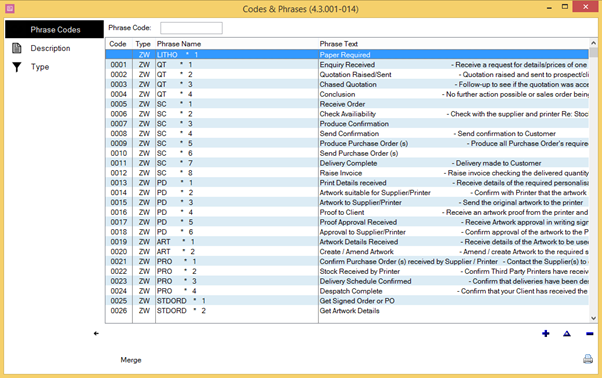 Click HERE to download a full size image of an example Purchase Order. The image shows phrase codes that are commonly used when creating Purchase Orders so you can find them more easily within Codes and Phrases. 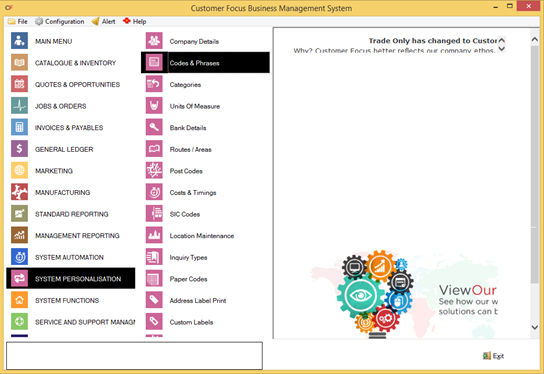 Phrase Code: PO95 - Allows customisation of the Company Registration and VAT Registration layout text. Phrase Code: PO98 - If own Product Number differs from the Suppliers Part Number, Automatically add these text to the end of the description. This allows our product code to be printed as text. Phrase Code: POSL - This text is used as the signing line that appears at the bottom right of the Purchase Order.